Category Archives: What’s in a Name? Filed under Dissertation Digest, Notes from the Field, Shipwreck culture, What's in a Name? I love finding out how places get their names. Names can tell you a lot about a place and the people who have lived, loved, worked, and played there. Many places around the world have been named for shipwrecks. This is the first in a new series of posts that looks at all those shipwreck-named places in the world. Know of one? Please send it along! This scenic beach on the western shore of Lake Michigan is named after the tragic wreck of the side-wheel steamer Alpena. In October 1880, bodies and wreckage from the Alpena–including a piano, which is at the local museum–washed ashore on the shoreline between Holland and nearby Saugatuck, Michigan. The steamer, all soon realized, had foundered in the middle of the lake during a gale known to history as the “Alpena storm.” Not one of the approximately 80 passengers and crew survived, and the wreck became a national media event. 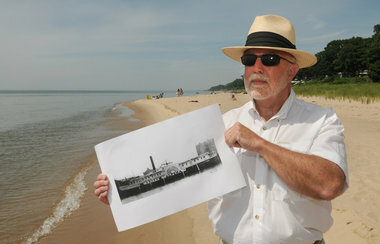 The beach, however, did not earn its current name until the Alpena‘s quarterboard washed ashore there in 1909, a full 29 years after the wreck. Soon after, the area became a mecca for tourists and visitors drawn not by any association with the Alpena but by an exotic zoo opened by an enterprising businessman. Visitors took Alpena Beach Road (now Lakewood Boulevard) to the Getz Farm zoo to see camels, monkeys, and other non-native flora and fauna. If the beach’s association with the wreck has been all but forgotten, contemporary wreckhunters have keep the memory of the Alpena alive–according to the The Grand Rapids Press: “Great Lakes wreck sleuths consider [the Alpena] be among the most sought-after discoveries the lake has yet to reveal.” The Alpena or the Griffon–wonder which will turn up first? For more on the beach or the wreck see this excellent article. Filed under What's in a Name?